Randy Edsall's opinion regarding the battle for the starting quarterback position hasn't changed since spring practice wrapped up. That certainly makes sense since there hasn't been a practice since that time. Bryant Shirreffs has started 21 games. He ranks in the top five in UConn history in passing efficiency (4th, 124.95) and total offense (5th, 4917 yards) and is in the top 10 in plays, passing attempts and completions and net passing yards. Donovan Williams started the last three games and after a knee injury sidelined him in spring camp, Edsall said he is healthy again. They certainly have the experience at UConn but certainly junior college transfer David Pindell is going to compete for the starting job and was brought here to do just that. "It's a wide open competition," Edsall said. "The guys know that and whoever the best guy is, that will be the guy to go out there. (Pindell) is a guy who understands the game, the presence that he has about himself has been really impressive watching him and how he goes about his business. He is a hard worker, he puts the time in to be the best he can." When Edsall spoke about the other quarterbacks, true freshman Marvin Washington's name was mentioned but Brandon Bisack (who received plenty of work in the spring) and true freshman Jordan McAfee were not. What does that mean? Not a heck of a lot. Pecking orders are not determined by quotes at a media day function a week and a half before the first practice of fall camp. Pindell, McAfee and Washington have not thrown a pass in an official practice at UConn. Something tells me that leaders will emerge early in camp because there aren't enough reps to go around for six quarterbacks. I'm not quite sure yet if we're going to be able to witness practice or not. We were able to see more practices when Bob Diaco was the head coach than we did during Paul Pasqualoni's time at the helm of the Huskies. I did some coverage when Edsall was UConn's coach in the past but it was more of just showing up for interviews or games. Something tells me I will not be at a heck of a lot of practices this season but time will tell. Players report on July 27 and there will be a media access period the next day with the first practice slated for July 29. Edsall made it clear yesterday that Arkeel Newsome will not be challenging UConn's single season record for rushing attempts of 367 set by Donald Brown in 2008. He said Newsome won't be a guy getting 25-30 carries a game. I'd look for him to be in the 15-18 range but to get plenty of balls thrown his way to try to get Newsome out in space. As a point of reference, Brown had nine games with at least 25 carries in 2008 and two years later Jordan Todman had at least 30 carries in five of the last six games. That was a different era and the offense being run by coordinator Rhett Lashlee will not resemble the one Edsall's teams ran in his previous stint. 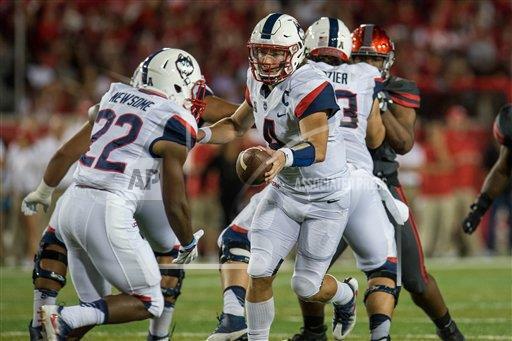 In his final three seasons UConn completed fewer than 15 passes 23 times and posted a 15-4 record when throwing for less than 150 yards. The Huskies will be passing early and often during the upcoming season and while I expect Newsome to be a major piece of that, I don't anticipate seeing him approach 300 carries in his final season at UConn. However, 200 carries, 50-60 receptions and some work on kickoff returns would still allow him to be a featured part of the UConn offense.